Members of the public in Luganville, Santo, are flocking day and night to a stream by the seashore that is claimed to have healing elements, although no scientific expert or medical data is available yet to back or rebut these claims. A caller from Luganville, told the Daily Post over the phone that, around 200 to 300 people; men, women, young people and children flock to the water site every day since its reported discovery. It was reported that some visitors drink the water at the source and others bathe in it further downstream as well as fill bottles and other containers at the source to take home to families or even send it to relatives in other islands. “The miraculous healing water is unbelievable,” the caller claimed. “It works and people flock to the spring water by the sea shore just outside Luganville daily to get to the water,” the caller claimed. 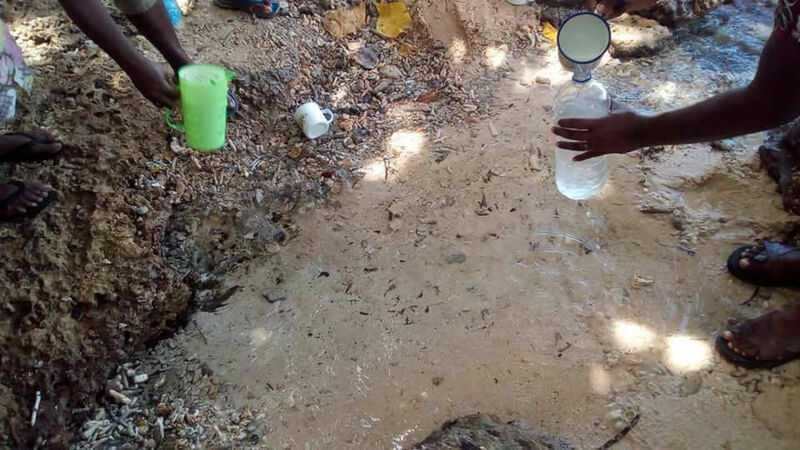 “Since its discovery, people with all sorts of diseases such as skin diseases, those who can’t walk, blind, deaf and internal problems have been bathing and drinking the water from the spring source that spreads along the foreshore,” the caller from Luganville said. A similar claim about a stream was made in Fiji over a year ago that attracted thousands of people with various diseases and disabilities that flocked to and still going to a water source. Some ni-Vanuatu even travelled to Fiji to visit this stream and brought it back to Vanuatu in bottles. “Here on Santo, there is no charge to come to the spring healing water because it is a free gift from God,” the Luganville caller claimed. Photos of people flocking to the spring water also appears on social media. At this stage Daily Post could not verify the claims from medical practitioners.